Meet Delaware St. John, a young detective with a unique gift for solving mysteries. Through an ability he cannot explain, he is contacted from beyond the grave by wayward spirits that seek peace and final justice. Delaware is awakened late one evening to the cries of voices begging for his help. Just before midnight, he finds himself in the rotting remains of the building once called Morrisville Manor. It’s been abandoned for years with stories of hauntings and a history of strange, tragic events. It doesn’t take long for Delaware to discover that the stories are true and it’s up to him to set things right. 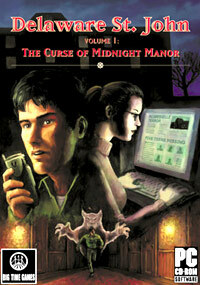 But it will take more than brains to avoid being consumed by the Curse of Midnight Manor. Something evil stalks Delaware through the halls of the decrepit building. Luckily for Delaware, his assistant Kelly has equipped him with a communication device that allows her to follow him along on the mystery from their office. With this device, he can send Kelly sounds, images and scans of whatever he finds. With her researching skills and his psychic gift, Delaware can get the missing pieces of the puzzle and just may survive the night. • An original, cinematic story full of mystery and intrigue. • Use a high-tech communicator to share discoveries with Kelly, the research expert. • Interpret puzzling visions to figure out clues to the mysteries. • Escape the dark creature that hunts Delaware from the shadows. • Unlock all of the mysteries of Midnight Manor by discovering clues that will unlock a second story.